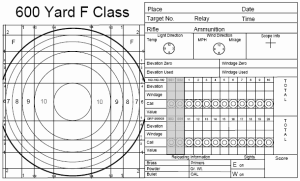 6mmbr.com - Competition and Benchrest Match Shooting Pages have Marksmanship and Reloading info for 6mm BR Norma and 6BR 100 yard, 200 yard, 300m, 600 yard and 1000 yard Benchrest and F-Class. Along with complete rifle, bullet, stock and Lapua brass sources and gunsmith contacts. Here's a collection of information to get you started in the competitive side of precision shooting. From informal club matches to 1000yd F-Class championships, shooting against competition is the best way to improve your marksmanship and wind-reading skills. Excellent new site with F-Class rules and match guidelines. Delphi Forum. Entry must be approved by Moderator. Serious Shooters. Scheduled CMP matches with Range Locations. Air Rifle, Highpower, and Garand. The Desert Sharpshooters offer plot sheets for marking match scores and wind calls. Plot Sheets are available for all High Power, 300m, and F-Class yardages, from 200 to 1000 yards. These are Acrobat (.pdf) files for easy printing. At right is a sample F-Class 600 yard plot sheet.